This entry was posted on Tuesday, March 30th, 2010 at 8:18 am and is filed under Marketing your Business, News from Mix. You can follow any responses to this entry through the RSS 2.0 feed. You can leave a response, or trackback from your own site. Congratulations on 100 blog articles. I look forward to 101. Thank you, congratulations on your 100th post as well! 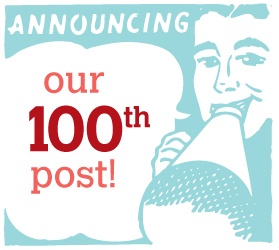 Congratulations on your first 100 blog posts. Here’s to the next 100! Yes, the personal learning and growth thing is one of the most rewarding, unexpected benefits. I appreciate your comments on my blog as well. Best wishes, D-mac.